Bored of your job? Looking to revamp your CV but can’t think of what new skills you might be able to add to it? Well fear not, if you commute using the train, I got you covered. Quick thinking – This is the tube, there is no time to think. You must act. Fast. Do it now. A moments hesitation could cost you that plush seat covered in filth or even save you from having the doors close in your face whilst you watch the people already on board look at you with a smug look. Analytical thinker – Getting a seat on the tube is a choreographed dance that is extremely complex and nobody actually knows the moves to. It requires communication that is both silent and allows you to have no eye contact. If you’re a commuter, you’ll eventually learn this jig and figure out just how to get to that seat in just a few moves. Love to further my knowledge – Commuters love to read. No matter how big or small the book, newspaper or kindle is, they will get it out and adopt an insane pose just so that they can escape from the horrific reality that is the rush hour commute. If you are one of these people, I salute you. Task focused – No eye contact. Even if you travel with the same people every day, you must not make eye contact. Terrible things will happen to those who gaze into another commuters eyes. You have been warned. Great time-keeping – As a commuter you will quickly learn that any train that is going to be longer than 3 minutes is an outrage. So outrageous that it is acceptable for your tut to be followed by an annoyed head shake. So, there you have it, 5 shiny new skills you can add to your curriculum vitae that you probably didn’t know you had. 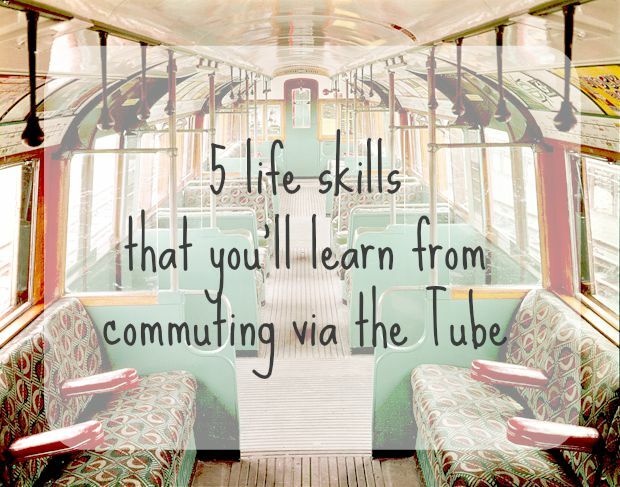 What’s your favourite thing about the tube?